As a registered investment advisor, AOG Wealth Management always acts in our clients’ best interests, offering personalized investment solutions to meet our clients’ financial objectives, goals and circumstances. Our investment management services can help high net-worth individuals, endowment funds and companies. 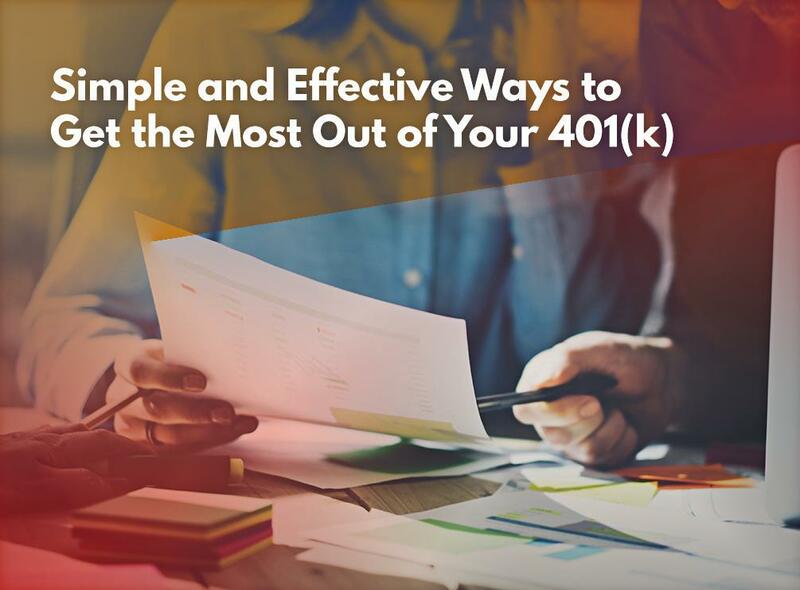 Today, we offer tips to help you manage and maximize your 401(k) plan. Avoid Withdrawing Early: Every 401(k) withdrawal means you are sacrificing important benefits from your previous plan contributions. One of the biggest benefits of the plan is that the contributions are tax deductible and growing tax-deferred. Withdrawing early means you have to pay income tax on the amount you withdraw along with an additional 10% early distribution tax. Consider Automating Future Increases to Your Savings: Most people’s financial situations are constantly changing, so it’s important for your plan to take this into account. There are many retirement plans that include a contribution rate escalation program. This updates the contribution amount every year, and it can have a significant effect on the amount of your 401(k) balance by the time you retire. If you need more information about retirement planning, give one of our asset management advisors a call. Choose the Right Investment Mix for Your Needs: Your asset allocation model needs to match your investing time horizon with your comfort level with risk as an investor. Carefully study your retirement plan and diversify your investments according to your financial situation and objectives. It may be helpful to consult with a registered investment advisor like us for more specific advice. Our asset management services can help you safeguard and grow your wealth. We observe rigorous, on-site due diligence in all our prospective investments and provide our clients with customized financial solutions. AOG Wealth Management serves communities in and near McLean, VA and Washington, DC. Call us at (866) 993-0203 to learn more about our wealth management services. You can also fill out our contact form for a complimentary consultation. There are material differences between the terms under which endowments and individuals can invest in alternative investments. These differences include, but are not limited to commissions and fees, conflicts of interest, access to investment opportunities, size, investment time horizons, and the ability to tolerate illiquidity. There is no standard or exact definition of the endowment model. Portfolio design, specific investments and ultimately performance vary considerably among endowments and investors. Kalos Capital and AOG Wealth Management do not claim that any investor will achieve the same result as any endowment, institution, or other investor. AOG Wealth Management Investment Advisor Representatives may have a conflict of interest when they recommend securities where they earn a commission as Registered Representatives of Kalos Capital. We address this conflict by disclosing the fees and commissions related to the investments recommended to our clients. Also, Kalos representatives and AOG Wealth Management Investment Advisor Representatives do not earn both advisory fees and brokerage commissions on the same asset. The endowment model may incorporate asset classes and/or individual investments that are illiquid (less than quarterly liquidity) and contain speculative elements and therefore may not be suitable for investors with short-term liquidity needs or low tolerance of risk in their portfolio. We will discuss each individual client’s risk tolerance, liquidity needs, and ability to withstand capital losses in their portfolio, prior to making any recommendations.